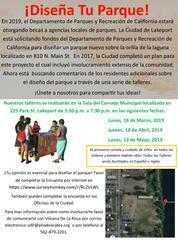 In 2019, the CA Department of Parks will be giving grant funding to a number of local park agencies. The City of Lakeport will be applying to build a new lakefront park at 810 North Main St. 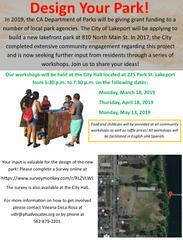 In 2017, the City completed extensive community engagement regarding this project and is now seeking further input from residents through a series of workshops. Join us to share your ideas!